Did you know that most tree health is determined from below ground level? In other words, many tree problems are the result of: soil compaction, pesticide uptake, root damage, poor soils, or poor planting. Our general philosophy is that with a little extra water, nutrients and care, trees should be able to live long healthy lives. We may need to add a little fertilizer or spray for a heavy insect infestation, but in general, trees are truly self-sufficient. However, in the case that additional care is necessary, Destiny Tree Care offers a variety of options designed specifically with your outdoor beauties in mind. Below you will learn further. If you have questions or would like to schedule a consultation, Destiny Tree Care is just a phone call away. Feel free to call us at 916-370-0687 anytime. We will gladly assist you any way we can. Quite often trees develop weak or poor structure, requiring special care to preserve them and prevent further injury. Even trees that are routinely maintained may develop weaknesses that affect their own safety and that of people and property. The most common problem is the weak attachment that may occur when two or more branches of about equal size arise at the same level on the trunk. Horizontal branches become heavy and dangerous. Even though pruning thin hazardous branches, this may not be enough and cabling and bracing may be required to reduce stress. Cable and bracing involves attaching a flexible steel cable between branches to limit excessive limb motion and reduce stress on the branches. Bracing uses bolts or threaded rods to secure weak ends. 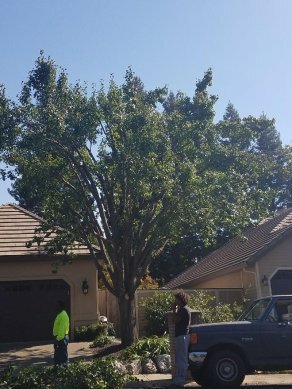 Our experts at Destiny Tree Care will assess the overall condition of the tree to determine if cabling and bracing is in the best interest of the tree or not. Residential communities are often built near existing trees to take advantage of their aesthetic and environmental value. Unfortunately, the construction process can be deadly to nearby trees. Proper planning and care are needed for tree preservation on building sites. Our experts at Destiny Tree Care can help you decide which trees can be saved. We will work together to protect the trees throughout each phase of construction. At Destiny Tree Care, your tree's health and well being are our passion. We are dedicated to remaining abreast of the latest innovations in the tree care industry. We invite you to continue your tour of our website. If you have questions or would like to schedule a consultation, please contact Destiny Tree Care at 916-370-0687.